Following Legendary's and Warner Bros. Pictures' 2014 success with the global reinvention of the Godzilla franchise, the companies have come together to create an epic, new shared cinematic franchise. All-powerful monsters become towering heroes for a new generation, revealing a mythology that brings together Godzilla and Legendary's King Kong in an ecosystem of other giant super-species, both classic and new. Monarch, the human organization that uncovered Godzilla in the 2014 film, will expand their mission across multiple releases. The announcement that the reinvention of monsters continues was made today by Legendary CEO, Thomas Tull, and Kevin Tsujihara, Chairman and CEO, Warner Bros. The initial trio of films are 2017's Kong: Skull Island, Godzilla 2 in 2018 and then Godzilla Vs Kong, arriving in theaters in 2020. While Legendary maintains its new home at Universal Pictures, the Godzilla films remain in partnership with Warner Bros., who will now also distribute Kong as a part of this franchise. Production on Kong: Skull Island begins October 19th. Warner Bros. and Legendary released Godzilla in May 2014 with an agreement to release Godzilla 2 on June 8, 2018. Both films feature the human Monarch organization. Shortly following Legendary's pact with NBC Universal, Legendary acquired rights to additional classic characters from Toho's Godzilla universe, including Rodan, Mothra, and King Ghidorah. This paved the way for developing a franchise centered around Monarch and anchored by Godzilla, King Kong, and other famous creatures. Here's what Kevin Tsujihara had to say in a statement. "Working with our partners at Legendary, we enjoyed tremendous creative and commercial success with Godzilla . It's great to be able to revisit these characters and help create a franchise with so many creative possibilities for filmmakers. Fans love these big, globally iconic films and it doesn't get any bigger than this." 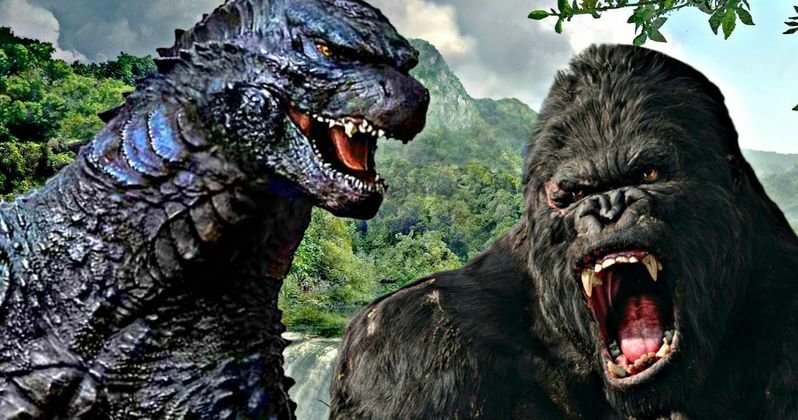 When Legendary announced films centered on Godzilla and King Kong, fans all over the world speculated these two characters might one day meet in the same film. Classic Toho monsters including King Ghidorah, Mothra, and Rodan, as announced at Comic-Con 2014, may also join the Legendary pantheon of giant monster mayhem going forward. Here's what Legendary's Thomas Tull had to say in a statement. Related: Godzilla: King of the Monsters 5-Minute IMAX Preview Is Playing with Shazam! "Audiences really responded to Godzilla. Today, I'm excited to reveal that film was only the beginning of an epic new entertainment universe. As a lifelong fan of these characters, I've always wanted to see the ultimate showdown, and today we're pleased to be announcing that and more." About the Productions: Kong: Skull Island stars Tom Hiddleston, Samuel L. Jackson, Brie Larson, John Goodman, Tian Jing, Corey Antonio Hawkins, Jason Mitchell, John Ortiz, Shea Whigham and Toby Kebbell. Directed by Jordan Vogt-Roberts and written by Max Borenstein, John Gatins, Dan Gilroy, and Derek Connolly, Kong: Skull Island will fully immerse audiences in the mysterious and dangerous home of the king of the apes as a team of explorers ventures deep inside the treacherous, primordial island. Legendary's Thomas Tull and Jon Jashni will produce with Mary Parent. Alex Garcia and Eric McLeod will executive produce. Warner Bros. will distribute the film in 3D and IMAX 3D on March 10, 2017. Godzilla 2 will be written by Max Borenstein and directed by Gareth Edwards. Legendary is producing with Mary Parent, and Alex Garcia will executive produce. The film is set to be released by Warner Bros. on June 8, 2018. Godzilla Vs Kong will be released in 2020.